THIRD POST – OCTOBER 2, 2012 – PRESIDENT ASSAD REVIEWS SPECIAL FORCES IN ALEPPO AND EXHORTS THEM TO DESTROY THE TERRORIST PRESENCE IN THE NORTHERN CAPITAL. The Commander-in-Chief of the Syrian armed forces poses here in the uniform of a Colonel. Dr. Assad served as a physician-soldier in the Syrian army. In an astounding show of determination, President Bashar Al-Assad, reviewed the 4th and 5th Syrian Army Special Forces Brigades yesterday in Aleppo and exhorted them to “finish off the terrorist presence forever!” We have some special news about this development from Michael Mar’achli in Sqailbiyya near Hama. He just left Aleppo by its southern main highway through units of the Syrian Fourth Army Group and arrived two hours ago. He contacted Wael in Latakia who told him to contact SyrPer. I never met Michael before and found the land lines filled with static. I did record his conversation with me so that if there was an unclear passage, I could replay it and ascertain the substance of the communication. I will be introducing a new feature on SyrPer in the future. Important Arabic passages will be reproduced in Arabic with adjustments made for colloquial. Michael is a native of Aleppo but has family living in Hama Province. Michael paints an ugly picture of the battle for Aleppo. He says that the Syrian army is fighting a very brave battle against mostly “foreign mercenaries” whose only talent appears to be jumping into people’s homes and nesting there. He describes the foreign fighters as rat-like with attendant survivalist training. They are completely alien to the area, sometimes roaming in neighborhoods with populations clearly hostile to them. In one neighborhood across from Sukkari, a woman started shouting at a group of four terrorists from her balcony. She screamed she didn’t want any part of their jihad and that they had better get out before her sons killed them all. The group, which appeared to Michael to be North African by their physical features, said nothing and left without a word exchanged. The terrorists are completely disoriented. As we reported to you in previous posts, Erdoghan’s regime made the decision to evict whole units of Libyan and Yemeni killers from bases in Hatay Province. This resulted in a disastrous confluence of tactical mistakes mostly committed by the inexperienced German and British technical support teams who were supposed to guide the criminals toward productive zones. Instead, Syrian military intelligence picked up communications between the terrorists essentially committing them to a re-gathering in Aleppo. There was no other way. All the nonsense you are hearing in the news about the FSA “decision” to retake the city is an effort to save face while the ranks of their killers are splitting at the seams. Pure anarchy reigns now in the so-called “opposition”. Dr. Assad visited the two special forces brigades and told them that the “time is right” for a complete extirpation of the murderers in the city. Just as the Germans and English believe Aleppo is the final battle to establish the opposition, the Syrian government shares the view that the city must be restored to its unchallenged control. We now know that there are over 23,000 Syrian troops surrounding Aleppo with thousands of security agents, militia and infantry inside. The terrorists will be defeated but at a high cost to the infrastructure of this great and ancient commercial capital. Maybe, that’s what the Obama regime is planning anyway. Sukkari has been cleansed of the terrorists presence. We are not exaggerating when we report that hundreds of terrorists are being killed. This tells you that Aleppo has become the cynosure of NATO’s inept plot to overthrow our government. Michael confirms what Wael has been telling me: The Syrian army is killing the terrorists in droves. This supports our assessment yesterday that the number of Islamist killers is close to if not greater than 10,000. I asked Michael about the possibility that the West might succeed in its war of attrition against the Syrian army. He says: “No way!” He seconds SyrPer’s conclusion that the more these terrorists infiltrate the country, the more Syrians are coming together. There is a sense of destiny here. Do you want to live under the rule of Islamist Jihadist troglodytes or a secular, progressive government? The answer is clear. This explosion went off in the PKK-controlled Eastern Syrian town of Qamishli. The Turkish MIT is suspected of having planned this in retaliation for PKK successes in Turkey. Hanadi commented relevantly that the PKK suspects the hands of the Turkish MIT in the explosion. Although no informants have come forth with any evidence, the nature of the suicide bombing, coming on the heels of the PKK’s repeated successes in attacking Erdoghan’s troops in the south, has all the indicia of a “revenge gesture”, as she put it. She also added that Erdoghan is wasting his time trying to negotiate with the Kurdish militia because his entire world view is Islamist whereas the PKK is very progressive and distrustful of anything that smacks of Islamism. This PKK fighter has Erdoghan in his sites. 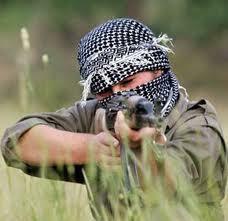 Many women serve in the PKK as committed revolutionaries. I’m picking up new articles as I write. I’ll be back.